Nick Vujicic was born with no arms and no legs. Talk about an obstacle, and an excuse for pity! Yet, Nick has lived a full, exciting and adventurous life because of (not despite of) the way that he was created. 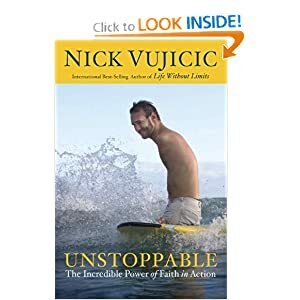 “Unstoppable” is about the lessons that Nick has learned throughout his life about actively living out our faith in Jesus Christ. He writes with transparency, allowing the reader to see the true Nick as he describes his thoughts and emotions during specific experiences in his life. I really loved reading about how God brought him and his wife together. I loved hearing about how God has used him in the lives of so many people with physical disabilities, all because Nick is willing to go wherever God leads him to go. Each story is filled with such love and grace. My reaction as I read this book can be summed up in one word: Wow. Nick Vujicic is an incredible, inspiring man. The obstacles he has faced throughout his life are astounding and humbling at the same time, because I complain about far lesser obstacles than he faces on a daily basis. I really want to read his first book now so that I can learn even more about his life story! This is well worth the read. I received a copy of this book from Waterbrook Multnomah in exchange for my honest review.